In the backdrop of the suspects in the murders of Sunday Leader editor Lasantha Wickrematunge and Prageeth Ekneligoda been released on bail, Foreign Minister Mangala Samaraweera has declared that the investigation into both murders were moving forward as both cases were of very high importance to his government. He made this statement in response to a question raised by journalist Johan Mikaelsson who highlighted that there were claims where moves were afoot to safeguard the culprits behind the two murders. During his official two-day visit to Sweden, he delivered a lecture on the invitation of The Institute for Security & Development Policy (ISDP) in Stockholm. 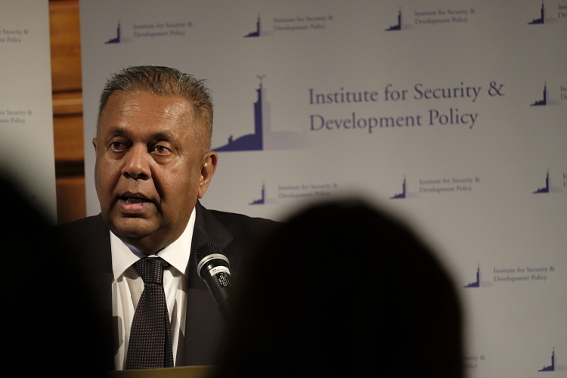 Elaborating his answer further he also said that even in the case of Ekneligoda, Samaraweera recalled how several army intelligence officers were arrested and were now released on bail. “But this is till the final case commences. These two cases are of great interest to us, and politically it is of great importance to our government that we proceed with these investigations. So, I can assure you that despite the delays, both cases are moving forward,” he said. The foreign minister’s statement comes in the backdrop of the CID grilling Minister and former Army Commander Sarath Fonseka for some five hours over the murder of Wickrematunge. Regaining GSP+ Or Squandering Sovereignty? How can anyone touch army intelligence officers? Mangala may not know the whole picture. There had been many unresolved murders. It was alleged most of them were carried out by the military intelligence or the military personnel. How long can they spare the man in charge of the then defence? French Aid workers, 5 students at Trincomalee beach, numerous journalists, minister Kadirkamar who was tipped to become prime minister and MPs? There are many in the present CID who also must be investigated. Because some higher officers are still defying court orders to hand over the names of surrenders just after the end of war. This will also answer few unanswered questions on missing persons. No one including the president can be above the law. Good to hear that. Is this appeasement talk? So far the killers have lived 10 extra years longer than Lasantha Wickramatunga. The killers have even bribed Lasnthas’s brother Lal, with the stolen billions, to point a finger at Field Marshall Sarath Fonseka. The Traitor, Turncoat, Gona, Mala-Peretahaya and Sevalaya, aka, Sirisena, is giving a different message, courtesy of Rajapaksa’s stolen billions, aided and abetted by the Justice Minister, Deal-Dasa, Wijedasa. It looks all the LTTE misbehaviours and getting killed should be investigated. Because, that is what LTTE rump wants. It is tamils’, muslims’,NGOs’ country. Sinhala buddhists and forces are being tried because Politicians got donations from LTTE rump and politicians have to make happy Tamils and muslims. Why in the world, in Sri lanka, politicians completely unrelated to the issue have to talk about murder investigations. In decent societies, even minister responsible never talk about issues related to bureaucrats. No wonder UFOs are sighted around Sri Lankan coasts, now the aliens have landed? It was reliably alleged LTTE were given massive donations to ensure MR’s victory in 2005. Every citizen has a right about murder investigations as they are criminal acts committed outside the law. The law must be upheld even if the perpetrators are military personnel. to quote you “In decent societies, even minister responsible never talk about issues…..” unquote. Well in decent societies one would not be segregating its citizens as “Sinhala Buddhists”, “Sinhala Christians”, “Muslims”,”Tamils”, etc as you have just done in the previous paragraph before complaining about the SL politicians’ behavior. This is the problem with most Sri Lankans who are ready to complain about others whilst being blind to their own prejudices and faults. Sri Lankans need to truly rise above race, religion and class and only be willing to identify themselves as SRI LANKANS, if they want to be compared to decent societies around the world. It seems that the government is making sure that these culprits will not be punished as it happened in the case of the assassination of Tamil parliamentarian Raviraj.In that case all the accused army intelligence officers were acquitted recently.The foreign minister’s assurance should not be taken as a serious one at all.It is politically disadvantageous for them to punish the culprits.The judicial system in this country is still very bias and the political elites or their underworld agents go Scott free. Does the UNP IGP Pujithaya take orders from our lovely Mangalan too…. All the cases involving the Rajapaksas criminal network will be intentionally dragged on and no one will be held accountable in the end…. There has to be an international involvement by INTERPOL and CIA to monitor and document this network and expose them and have the law deal with them too if any meaningful action can be taken against the Rajapaksas and their criminal network…. yeah … heard about snails?? One of them worked for this guy. This how Mangala have killed everybody’s hope! If we don’t see results before the first term of this government ends we know for sure that they are stalling and maybe even protecting these criminals!? Under the given circumsatances, how best can the FM represent matters other than his statement? Is he to sensationalize by saying that arrests of high profiles are imminent? I don’t think so. The slow pace of activities and finally acquittals only result in suspecting of the sincerity of those in authority. What about Dubai bank accounts you told us were holding funds stolen by family from hell? If and when the accused in the Lasantha & Ekneligoda cases are eventually tried before a High-court and of-course before a Sinhala speaking Jury there would be an established precedence to follow; The Raviraj Murder Trial! How can murder suspects be released on bail? Not only they were released they were reinstated in their posts by President Sirisena. Sirisena is adamant that no member of the armed forces should be punished for war crimes because the members of the armed forces are war heroes! With such stupid and warped mind-set can anyone expect those who murdered Lasantha, Egnaligoda, Ravi Raj MP, Joseph Pararajasingham MP, 17 aid workers of belonging to Action Contra la Faim (ACF), the charity for which they worked will be brought to justice? Pillayan who was behind the murder of Ravi Raj was appointed as Chief Minister by Mahinda Rajapaksa. He also rewarded Karuna, LTTE renegade with a Deputy Minister’s post. The only progressive and non-communal minister in Sirisena’s cabinet is Mangala Samaraweera. Elect him as the president next time to get rid of rampant corruption, nepotism, waste and restore the rule of law. Sirisena cannot reform the state administration he was hand in glove with Rajapaksa. At this rate and things stand Paradise will be lost irrevocably.